One of my biggest fears used to be public speaking and talking in front of a crowd was something that I struggled with. Early on in my career, I took a Toastmasters course that taught me the helpful tips that have colored my formal interactions (whether that’s at a cocktail party with new people, a business lunch or headlining a speaking engagement). I also learned the value of making a strong first impression and to try to avoid some of the common pitfalls. Here are five tips I learned for coming across confident, smart and self-assured. Don’t upspeak. Upspeak refers to the act of turning a regular statement into what sounds more like a question. I used to upspeak all the time and my sentences used to lilt higher at the end, which made me sound unsure of myself instead of poised and assertive. Don’t apologize. It’s so common for people to start sentences with an apology like “I’m sorry.” Starting a statement with a false apology decreases the impact of your statement, so remember that your opinion has value and stand by what you’re saying. Unless you’ve wronged someone or made a mistake, there’s no need to apologize. Offer a firm handshake. Make good eye contact, use a firm grip and a friendly smile when you shake someone’s hand. This may sound obvious, but I’m constantly surprised by how many women introduce themselves with a handshake that feels like a limp fish. Eliminate filler words. At Toastmasters, we’d be given a random topic to speak about and someone would tally the amount of times you used words like um, uh, like and so on. It’s actually better to let there be short silences between thoughts than relying on fillers because they don’t add much to a conversation. Stand tall. When it comes to social situations, it’s important to stand tall and avoid things that make you appear unfriendly, like crossing your arms or shifting your weight from side to side. If you look steady and approachable, you’ll make a much stronger first impression. Emily Schuman created the uber popular Cupcakes and Cashmere in March 2008 as a way to document the things she loved. More than a blog, it is a mantra and aesthetic that celebrates the little pleasures in life. The site encourages and inspires readers through fashion, food, beauty and interior design. 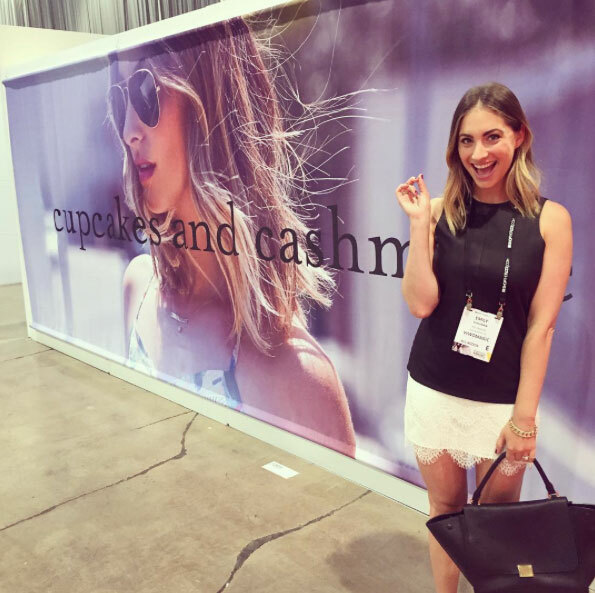 In 2015, Emily released her second book Cupcakes and Cashmere at Home and debuted the Cupcakes and Cashmere clothing line. She lives in Los Angeles with her husband, daughter and three cats.